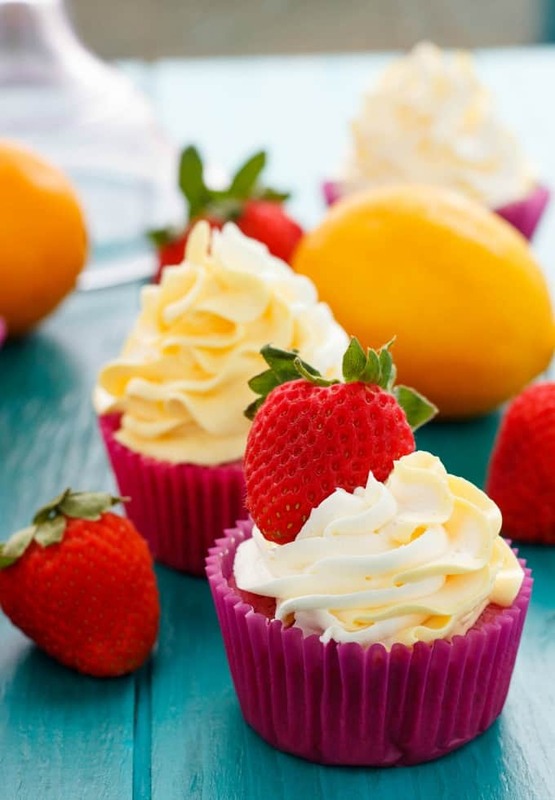 Spring and summer-like in flavour, these strawberry cupcakes with lemon swiss meringue buttercream are fun to make and refreshingly light! The photos and recipe for these strawberry cupcakes with lemon swiss meringue buttercream have been updated as of May 14th, 2016! I am stressing out with everything that is happening lately! Don’t get me wrong, it all leads to positive changes, but when it happens all at once it can be overwhelming. After wearing glasses since halfway through kindergarten, I am FINALLY getting laser eye surgery! Yay! I am excited, and a tad nervous, but it is a hassle with 3 appointments all being an hour away and two of them being on Easter weekend. It might just be my nerves talking, but I think about it at night so I am not sleeping well. Everyone states it is the best thing they could have done so I am just worrying for nothing. We have also been tackling some major house upgrades since the first week of the new year. New hardwood floors through the ENTIRE house, and doing all the work ourselves. Remodeled our bedroom by ripping out tons of drywall and putting up new stuff (leaving me with the awesome task of mudding!) Then there was the plan to remove a wall upstairs but turns out that might not be as simple as we thought. Doing all this ourselves has saved a ton of money, but we have been living in a construction zone. Finally got the hardwood into the kitchen and I decided to re-oil my counter tops (butcher block) at the same time so I was left to prep everything on my kitchen table for three days… Finally getting back to normal, but soooooo much dust!! Okay, no more complaining! Need to calm my nerves, and writing helps! With Dan being off for almost 10 days, his coworkers were left with no sweet treats! I know, crazy! One celebrated a birthday during his time off so I wanted to make sure on his first day back to work he had something special to share. 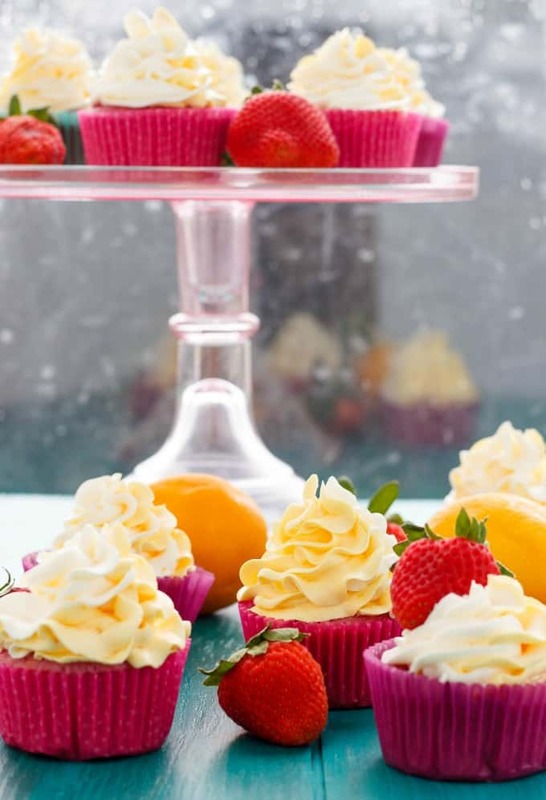 Now, these strawberry cupcakes with lemon swiss meringue buttercream were created for a couple of reasons. First, I have made an inverted recipe in the past: lemon cupcakes with strawberry swiss meringue buttercream. They were amazing! One of my favourites! I wanted to revisit them for an Easter recipe, so that brings us to today’s post. Another reason I wanted to make these strawberry cupcakes with lemon swiss meringue buttercream was for the fact that every strawberry cake recipe I see online calls for Jell-O, not real, fresh strawberries… I do not care for Jell-O at all, and really wanted to make a cake using fresh strawberries. I worked with my basic vanilla cake recipe and adjusted accordingly. I found my first batches came out quite dense. It sucked because I had decorated them with the lemon swiss meringue buttercream perfectly! I mean seriously, that has to be my best swirl to date! I even put half white frosting, half yellow frosting into a bag to give it a ice cream two-tone swirl look. Arg. His coworkers enjoyed the cupcakes, but I was not happy. So, the following day I revisited them and adjusted the recipe by leaving out more liquid. These strawberry cupcakes turned out perfectly! Of course, I always find re-whipping buttercream never results in the same silky, smooth texture as the first day, so my piping was a little off, but I wanted to show the difference in the two cakes. I blame the first batch being off because I did not have any counters to work on and I seriously wondered if I left out the baking powder since my cupcakes barely raised! The second batch worked out so well, I totally scrapped the first recipe and rewrote it. As for the lemon swiss meringue buttercream? To die for! I love swiss meringue buttercream, and these strawberry cupcakes with lemon swiss meringue buttercream would not be the same without it. Silky, smooth, and so easy to work with, I prefer it over traditional American buttercream. It does taste a lot like butter when no flavouring is added, so make sure you taste as you go. I know people are always worried about making swiss meringue buttercream, but take a look at my step-by-step tutorial and see for yourself that it is super easy! I find adults prefer the swiss meringue buttercream, whereas children love the sugary qualities of American buttercream. The cupcakes become a pretty pink naturally, but I added some red food colouring for pop! In the bowl of a stand mixer, add the coconut oil, lemon zest and sugar. Beat until light and fluffy, about 5 min. Beat in the eggs one at a time, making sure to combine well before adding the next. Add vanilla extract, strawberry puree, and mix well. With the mixer on low, add in the flour mixture and milk mixture alternatively, always starting and ending with the dry ingredients. Preheat the oven to 350F. Line a cupcake tray with cupcake liners. Fill the liners with batter, about 2/3 of the way full. Place tray into the oven and bake for 15 minutes, or until toothpick comes out clean. Allow to cool slightly in tray and then move cupcakes to wire rack to finish cooling. Pour about an inch of water into a small saucepan. Place over low heat and pick a bowl that will fit snugly on top of the opening. Cut your butter into bite-size pieces, about 1 tablespoon each. With your mixer on medium, add one piece of butter at a time, counting for about 10 seconds before you put the next piece of butter in. Pay attention and make sure the butter is combined before you add the next piece. Patience is key! Keep mixing until all the butter is combined in and you are left with a smooth buttercream. Add in the almond extract and lemon zest. Pour in the lemon juice and mix until well combined (you may have to scrape down the sides to get the juice to incorporate.) Finally, add in desired food colouring. I love natural food colouring in recipes! 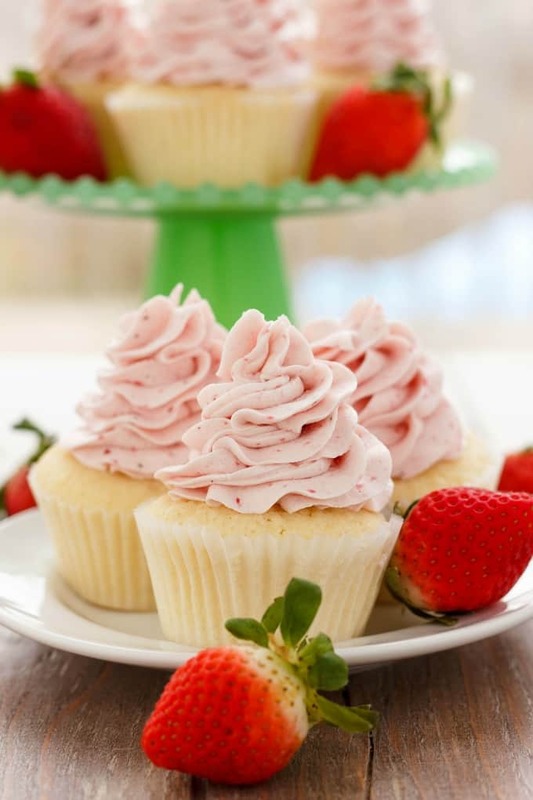 These strawberry cupcakes with lemon swiss meringue buttercream are a mix of both artificial and natural. 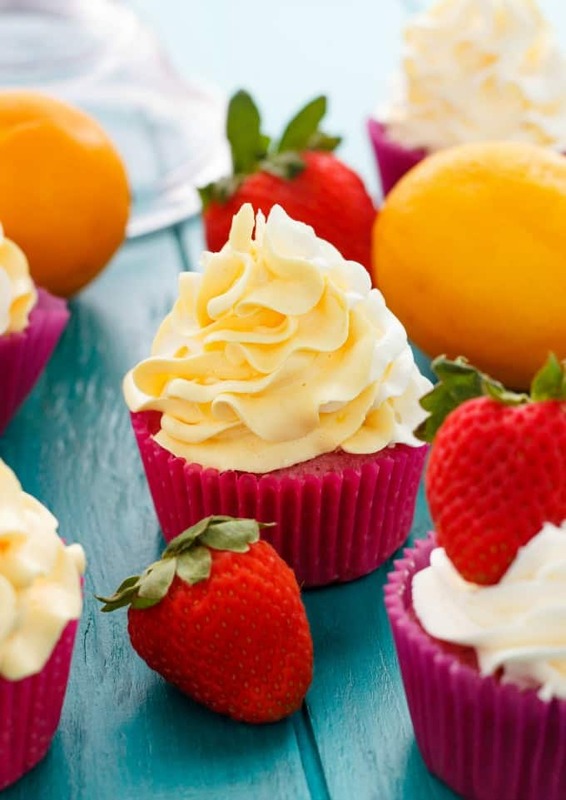 The red of the strawberries does pull through in the cupcakes, but let’s be honest, there is no way that buttercream is turning yellow with just fresh lemon juice. Feel free to omit the colouring altogether; I was going for an Easter/spring feel about these desserts. One last note: use freshly squeezed lemon juice, PLEASE. The artificial lemon extract will not cut it. You will notice a difference. I used just under 1/4 cup of lemon juice, but only at my daughter’s request. It is not sour at all, and I have no problem with the full 1/4 cup. The lemon zest only adds more flavour, but if it is not your thing, omit it! I love the flavor combo of strawberry and lemon and Swiss Meringue is my favorite buttercream. Its all I make. 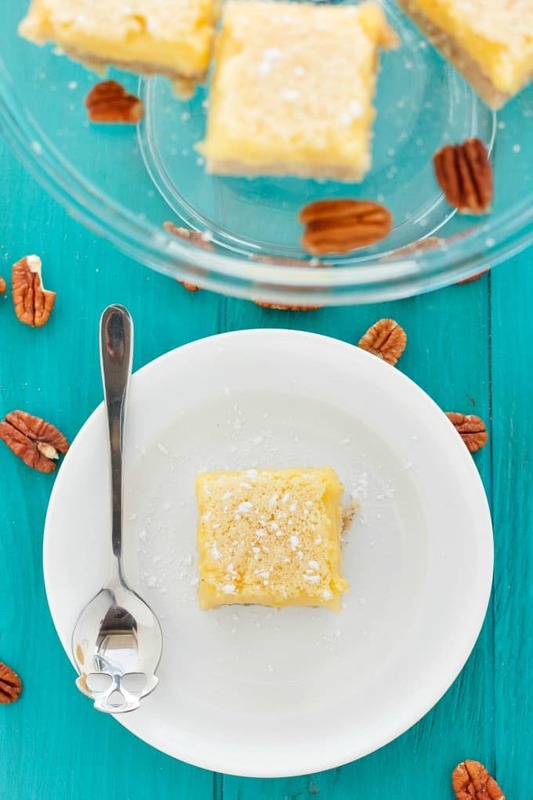 So buttery and good and not too sweet. Perfect with lemon too. And I love how you swirled the colors. Good luck with the eye surgery - I am sure it will go well! Thank you, Shanna! I have to say, Swiss meringue buttercream is my favourite as well. These sound fantastic, I love the flavor combo...and your frosting is so perfect. I'm glad that things are starting to get back to normal...I bet it will all be worth it! It will be! Thanks, Heather. These cupcakes are so pretty! I'm anxious to hear how your lasik goes, everyone I know who has had it done, loves the results. I've been thinking about it. I will let you know for sure, Joanie. Everyone I know has said the same thing. First: yay for Lasik! My hubby used to want it--somewhere along the way he gave up (money) but I know what a difference it would make for him. Second: definitely Swiss buttercream. Third: OMG THANK YOU for not using anything jello or fake! Totally pinning these for next time I need a strawberry cake to taste like strawberries! Or anything fake that should say lol. I hope he gets the chance to look into it again! Everyone says how they wished they had it done sooner. SMB for the win! I hope you get the chance to make the recipe! Kacey, I'm totally with you on wanting real strawberries instead of jello. I've never used strawberry puree in a ckae, but I'm imagining a soft and lovely flavor peeking through the cupcake. What a beautiful way to ring in springtime! PS - Will you come over and teach me to pipe frosting onto cupcakes? Yours are almost too beautiful to eat, emphasis on the "almost"
These cupcakes....and that frosting!!!! What a delicious combination! Good luck with the Lasik! I've wanted to try that but haven't gotten the courage to get the evaluation. These cupcakes look delicious especially that frosting!